Hey Friends, welcome to the amazing world of tips and tricks. After many SEO tips I am back with some cool Blogger Tricks. 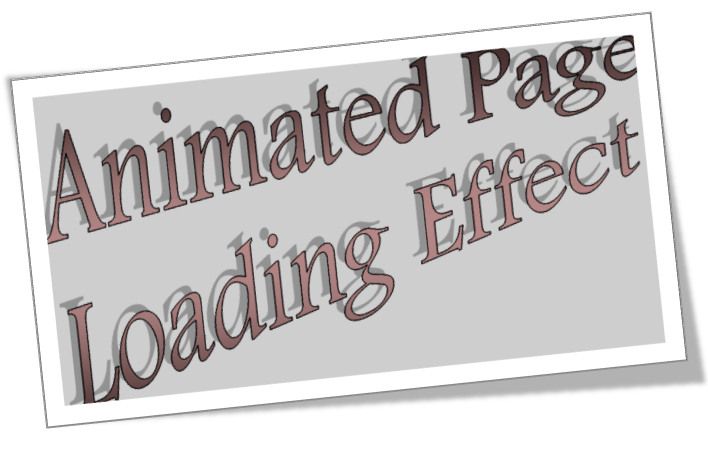 In this post I will show you how to animated page loading effect in Blogger. Isn't it cool to show of your visitors a loading effect while your page loads. It will surely give your blog a professional feel. In this post I will provide you different ways to add animation effect in Blogger blog. You can also add animated loading effect on Blogger sidebar. I will explain you each and every ways to create a beautiful animation effect in your blog. You may be receiving users who don't have much faster Internet speed. And sometimes they may feel bored by waiting while the page loads. If you will add animated page loading effect in your Blogger blog than it will make your users a little less boring experience. Now we can start the tutorial. Lets start with the easy method. Let me first remind you to make a backup of your template. It will surely help you if by chance you destroy your template. To make a backup of your template Go to Blogger Home > Dashboard > Template. Now in Template page click on Backup/Restore template and than Download your Template. Now as you have made a backup of your Blogger Blog. We may now know the trick on adding animated page loading effect in your Blogger Blog. First of all Go To Blogger Home. Now Go to dashboard. In dashboard click on template. In the Template page Click on Edit HTML. Press anywhere on the HTML page and than press CTRL+F to open search box. Now search for "]]><" without quotes. Now you have to paste the code given below just above "]]><". After you paste the above code as specified we can proceed to next step. Now search for "</body>" tag without quotes. Now paste the code given below just above/before </body> tag. Now save the template. You have just added animated page loading effect in your blog with just little CSS codes. You can also change the image of loading. To insert your custom gif file in place of default image than you can replace the URL in blue with your preferred image. In the previous method you learnt adding animation on your page loading with CSS method. As I said I will make you familiar with many ways. In this method I will show you adding Cool animated page loading effect with Jquery. This is more advance and easy. It will not slow your page loading so much. Let's see this method. As the title explains this method is based on Jquery. Jqury is really a fun and it helps in adding different types of functions and effects with ease. If you love Jquery and want to prefer this method for adding on your Blogger blog than follow these easy steps. Make sure you have a backup of your Template. Now Go to blogger Home > Dashboard. Now Go to template. In template page click on edit HTML. Now find the </head> tag. Now paste the code given below just above/before </head> tag. After pasting the above code in the specified place Search for </body> tag. Now you will paste the code given below just above the </body> tag. Now Save Template. Congrats! you just added Animated page loading effect with Jquery in your Blogger blog. You can change the Loading image if you want to change it. To change replace the image URL which is in blue with your own image. It will be good idea to keep animated image. If you think background color doesn't fit with your animated page loading effect image than you can change the background color of the loading page. To do this change the hex color value #FFFFFF with your preferred background color. That's all about the amazing page loading effect. Well these were the two methods of adding animated page loading effect on Blogger blog. I know this loading effect is really cool. I hope it will give your blog more professional feel and you will be able to impress your lovely users with this cool animated page loading effect for Blogger blogs. If you are facing any type of problem than feel free to ask me.